Ecuador says the country's latest efforts to negotiate the departure of WikiLeaks founder Julian Assange from its London embassy have failed. A UK Foreign Office spokesman said Mr Assange should "leave the embassy to face justice". 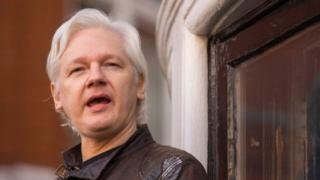 Mr Assange, 46, has been staying at the country's London embassy since 2012 where he was granted political asylum. Ecuador's foreign minister said: "On the issue of mediation, I have to say very honestly that it has not been successful because two parties are needed to mediate. Ecuador is willing, but not necessarily the other party". She said her country would "continue looking for mechanisms" to end the stalemate. But a spokesman from the UK Foreign Office said: "Ecuador knows that the way to resolve this issue is for Julian Assange to leave the embassy to face justice"
But the UK does not recognise Mr Assange as a diplomatic agent and continues to insist he should "face justice".